The end of season. It was the last opening day of my favourite restaurant in Portugal, when this piece came to be. 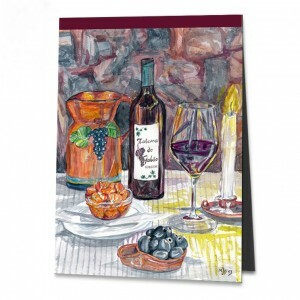 For the painting, Fernando, the owner, had placed a bottle of locally produced wine, a red wine glass and the olives on the table. Silvia, his wife, placed the earthenware jug of her friend, and I put the bowl with the delicious carrots there. There was still some light. So I got a candle and began to paint in all comfort. It was a cold, rainy day and no one strayed into the restaurant. Instead, Fernando and Silvia were busy packing away a few things for the winter. As time passed, the candle burned and burned. “Silvia, I need reinforcements!” I cried when I noticed that the light would soon run out. “That was the last one,” was her answer. “Oh no, as it is really dark here in the corner!” Whilst Silvia searched through boxes and drawers for candles, I hurriedly painted the dark stones of the wall, shimmering in the candlelight, as only they were missing from my painting. When I washed out the brush for the last time in the water bowl, Silvia sat next to me at the table. “I'm so sorry, but there is not one candle anywhere,” she said regretfully. “Never mind, I'm finished,” answering her in a good mood and we both watched as the candlewick slowly sank into the liquid wax. So even painting still life can prove quite exciting, as unlikely as it may seem.